Has the Bull in the China Shop Become Ground Beef? Since October of 2010, the People's Bank of China has raised interest rates five times in an effort to combat inflation. This tightening of monetary policy has led to a deceleration of economic growth in the P.R.C., and has been a factor in the global economic recession. There have been reports that this deceleration of growth has also dampened prices for Chinese collectibles, including stamps, that the once white-hot P.R.C. 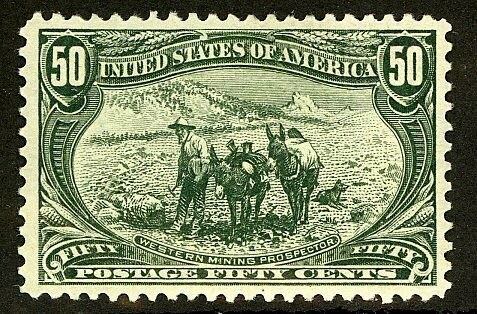 stamp market has cooled somewhat, and that dealer buy prices for many items have dropped by 20%-30%. 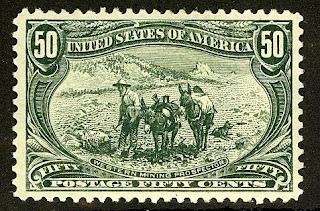 In a March, 2010 StampSelector blog article ("General Commentary - the Bull in the China Shop"), I commented on the dramatic price increases for P.R.C. material, and noted buy prices for several souvenir sheets and Cultural Revolution issues. In a second article (General Commentary - Has the Bull in the China Shop Met Its Matador? ), I discussed the rumors of a softening of the Chinese stamp market in January, commenting that at that time, buy prices for key items had remained strong. I've re-listed these items below, along with current buy prices. According to my sampling, there have been definite declines in buy prices for these key items since January, averaging just over 24%. It is possible that this selection of key items is not representative, or that it doesn't take into account fluctuations which may have occurred on a shorter term basis, or during months for which buy prices were not noted. It is clear that the slowing of China's economic growth has kicked in. On the plus side, the country's central bank has finally lowered its interest rates for the first time since 2008, indicating a long-awaited reversion to the policy of stimulating the economy. The Philippines were under U.S. Administration from the end of the Spanish-American War (1899) until 1935. In 1928 , stamps of the Philippines regular issue of 1917-25 were overprinted "L.O.F." to commemorate the London-Orient Flight made by a squadron of British seaplanes (Scott #C18-28). The Philippines were an important staging post on all major world flights of the twenties and thirties and the definitive series was overprinted in connection with these events on six occasions between 1926 and 1936. 6,000 sets were issued, and Scott '13 prices the unused set at $136.25 ($230.- for NH) . The set has multiple market appeal among collector of the Philippines, U.S. Possessions, and Aviation Topicalists. Though I often counsel obtaining expertization when purchasing stamps with overprints, in this case it's unnecessary, because the set is too inexpensive to warrant it, and there isn't a huge difference in value between the overprints and the basic stamps. 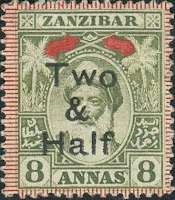 In 1904, the British created a surcharged set (Scott #94-98) for Zanzibar, which was then a British protectorate, by overprinting some of the stamps from the 1899-1901 Sultan Seyyid Hamoud-bin-Mahommed-bin-Said set (Scott #62-78). Only 2,619 of the surcharged set were issued, and Scott '12 prices it unused set at $ 313.75. 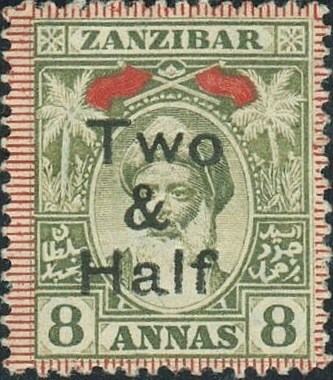 While I sometimes advise obtaining certificates on overprinted stamps, expertization is not necessary in this case, because there is not enough of a price difference between the basic stamps and the surcharges to make it worthwhile. 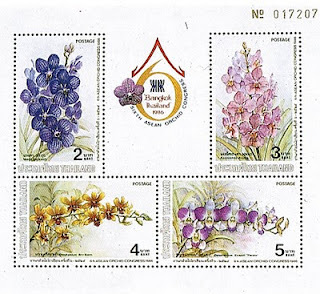 In 1986, Thailand issued a souvenir sheet picturing orchids (Scott #1160a), to commemorate the meeting of the 6th ASEAN Orchid Congress. Only 20,000 souvenir sheet were issued, and Scott '12 prices the unused sheet at $110.00.-. Aside from being an investment in Thailand's future economic growth, the sheet also has appeal as an attractive Flower topical. In 1942, the Netherlands Antilles issued a pleasant engraved set of 15 airmails. 30,000 sets were issued, and Scott '12 prices it unused at $55.50. 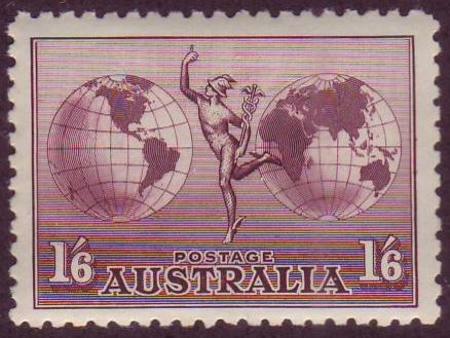 I continue to favor stamps of the European colonies and possessions over the stamps of their mother countries. The quantities issued for the colonies tend to be modest, and worldwide interest in them often grows at a faster rate. For the most part, stamp of the Netherlands Antilles appeals to Netherlands Colonies collectors, but as Curacao is a popular tourist destination, it's likely that in the future, interest in its stamps will grow in the Americas as well. With about 16.6 million people, the Netherlands is the 16th largest economy in the world. 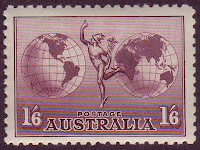 It is an affluent industrial and trading nation, with a well-educated population, and an active stamp collecting community. Its annual GDP growth has averaged about 2.5% over the last 5 years, reflecting a slowing due to the global financial crisis. 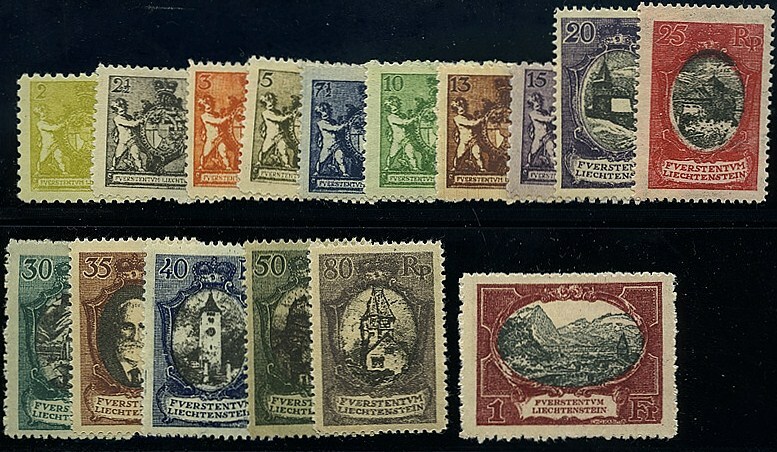 In 1921, Liechtenstein issued a set of 16 stamps, of which most of the high values pictured scenes of the principality (Scott #54-69). 65,505 sets were issued, and Scott '12 prices the unused set at $344.95 ($1.150.00 for NH) . Liechtenstein is one of Europe's smallest countries, but it's stamps are very popular worldwide, especially in Switzerland, Austria, and Germany. I recommend accumulation of the country's better items in anticipation of the European economic recovery. In 2000, Azerbaijan issued a miniature sheet of four stamps picturing native reptiles (Scott #709). 25,000 were issued, and Scott '12 prices the unused sheet at $6.50 . The sheet makes an interesting and low-risk speculation based on its appeal as an Animal topical, and as a bet on the economic growth of Azerbaijan and the development of a stamp market there. This recommendation is consistent with my belief that one of the best ways to play the new and newly resurrected countries of Europe and Asia is to focus on popular topicals with low printings. 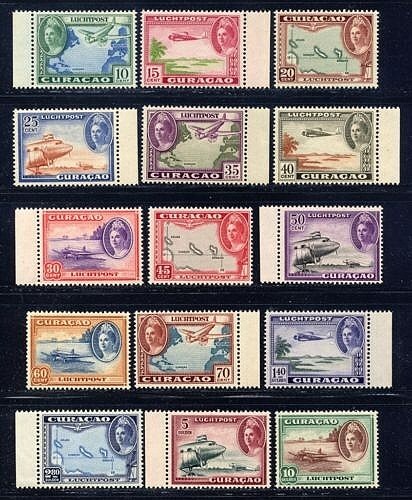 In 1933, Uruguay issued a set of eleven stamps picturing the "Flag of the Race", representing the Spanish "race" in the Americas and in Spain's various other colonies and former colonies (Scott #430-40). The set also honored the 441st Anniversary of the Sailing of Christopher Columbus, rediscoverer of the Americas, and the first European to bring enslavement, epidemics, and mass murder to the hemisphere. 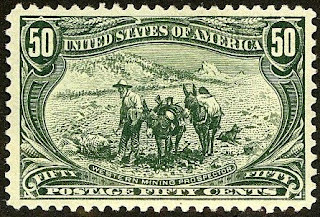 Only 10,000 sets were issued, and Scott '12 prices the unused set at $35.40 . 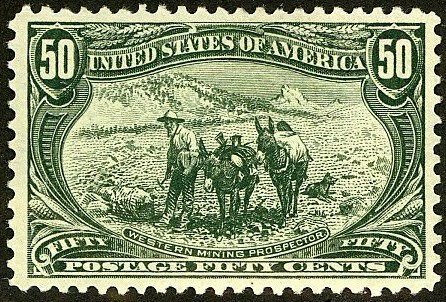 Most were probably used as postage and discarded, as Uruguay's economy was in crippled by the worldwide Depression of the '30s, and the only Uruguayans who could afford to collect its stamps were to be found among members of the oligarchy.